Rivers State Governor Nyesom Ezenwo Wike has declared open the 31st National Council for Arts and Culture, amid pomp and ceremony at the Sharks Stadium, Port Harcourt. 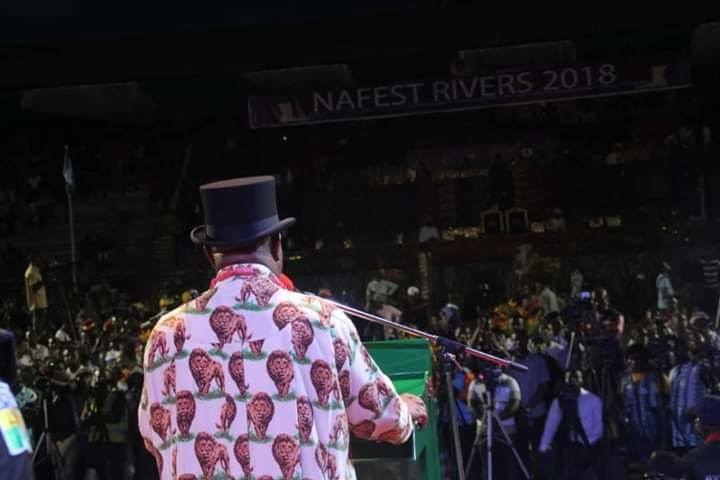 Wike, dressed in beautiful Rivers traditional attire, with a walking stick to match, said NAFEST 2018 will serve as a unifying force for the country. With the theme: “Nigeria: Our Festivals, Our Heritage”, NAFEST Rivers 2018, attracted 18 states of the Federation, including Rivers. “Whether we agree or not, our diversity is what defines and binds us as a nation, under the glorious sun. Although our tribes and tongues may differ, we are a nation bound by a common destiny and firmly glued together by the spirit of brotherhood, cultural harmony, and inter-ethnic solidarity instead of discord, tribalism, nepotism and sectionalism. “What is imperative, therefore, is for us to take full advantage of the innate strength in our diversity, together with our incredible human and natural resource endowments, to build a just, united and prosperous country for the present and future generations,” he said. Governor Wike added that the essence of the festival is to promote national peace, unity and cohesion. In his remarks, NAFEST Director General, Otunba Olusegun Runsewe, commended Wike for for making history for the people of Rivers State. He also said that outside Lagos and Abuja, Port Harcourt enjoys the highest air traffic and hotel patronage in the country. Commissioner of Culture and Tourism Mrs. Tonye Oniyide Briggs said that Rivers is fully prepared to host the very best NAFEST since its inception. All the states that participated at the event displayed splendid cultures and dances as they paraded round the stadium. The 23 local government areas of the state also displayed their rich culture and tradition. Youths spiced up the event with wonderful calisthenic displays which thrilled the thousands of spectators at the event.